The best known of Hawthorne’s works, The Scarlet Letter presents a sad tale of love and betrayal set within the context of seventeenth-century Puritan New England. The values and mores of the Puritan settlement influence the social as well as the gender expectations of the narrative, but Hawthorne through his narrator looks back upon this world with a nineteenth-century sensibility that affects the development of the characters. Within the novel, the individual minor characters and the community as a whole articulate the strict code by which individuals are expected to live and by which they are judged when they engage in wrongdoing. For the seventeenth-century world that Hawthorne recreates, emphasis is placed upon the struggle between righteousness and sin. Hawthorne explores how this emphasis contributes to individual failings rooted in self-righteousness and self-justification. The act that precipitates the unfolding of the narrative occurs prior to the opening scene. Hester Prynne, a young wife whose husband remains absent from the settlement, violates her marriage vows by engaging in a sexual relationship with the Reverend Arthur Dimmesdale, a minister who seeks to establish his place among the Puritan divines of New England. Jailed for her crime when her pregnancy becomes known, Hester is judged guilty of adultery. The novel opens as Hester is brought forth upon the scaffold to face public condemnation for her sin. While Hester stands upon the scaffold holding her newborn daughter Pearl, she sees her husband, who now goes by the name of Roger Chillingworth, standing at the edges of the crowd. She also sees her lover, Arthur Dimmesdale, standing in the company of Puritan ministers and officials. A brave and strong-willed woman, Hester refuses to betray her lover, but realizes from her perspective on the scaffold that she must faces her trials alone, that neither of the men who has affected her life will openly be a part of her future. These four characters become entangled in a web of concealment, deceit, and revenge, a web that can only be broken by honesty, confession and forgiveness. Released from jail and sentenced to wear a scarlet letter A upon her bosom so that all will know of her sin, Hester discovers that she must also fight to keep custody of her daughter. Mother and daughter live a simple life in a secluded cottage on the edge of town. This isolation allows Hester time for introspection, during which she engages in independent thinking, allowing herself to consider ideas that the Puritans would label antinomian, as she places faith and love above obedience to moral law and social custom. Hawthorne underscores this aspect of Hester’s nature by linking her to the seventeenth-century Puritan Ann Hutchinson, whose trial for heresy was at the center of the Antinomian Controversy. Hester supports herself and her child through her talents as a seamstress and needlewoman. Her work in this medium provides an outlet for Hester’s artistic sensibilities, which she exercises in the work she does for others and in the clothes she makes for Pearl. Hester dresses plainly and somberly, except for the highly ornate scarlet letter A that she has embroidered on the breast of her attire. Hester wears it as a badge of distinction as well as the sign of shame it is intended to be. Hester adorns Pearl in fanciful, bright clothing, cloaking her in outward signs of her own separateness from the Puritan community, a community that sees Pearl as the visible symbol of her mother’s threat to order and stability. Pearl is an impish child, sometimes seeming to be an integral part of nature, sometimes seeming to be the wicked embodiment of her parents' sin, always stubborn and whimsical and hard to control. 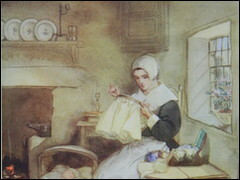 While the relationship between mother and daughter forms a central component of the narrative, Hawthorne also develops the relationships between Hester and the two central male characters, Arthur Dimmesdale and Roger Chillingworth. Each man has entrusted Hester with secrets he expects her to keep. Hoping to shield Dimmesdale and feeling a debt of obligation to Chillingworth, Hester reveals further aspects of her nature as she interacts with each man and makes decisions about how to respond to the demands that each places upon her. Although Hester wants to believe that flight with Dimmesdale is possible, she discovers that none of the characters can escape the consequences of their earlier actions. At times Hester contemplates her own freedom and the possibilities for a woman’s self-realization, but the end of the novel suggests that in such thinking, Hester is ahead of her time. When she returns to the Puritan settlement at the end of the novel, Hester continues to wear The Scarlet Letter, which “has ceased to be a stigma,” and has become instead a badge of her wisdom and insight.